There is a small building built over a spring on the outskirts of Liverpool where you can go and fill up water jugs with clear, fresh water. Since my mother has "hard" water from her well we often drop by on trips to town to do so. One time two years ago we stopped by in July. I noticed a beautiful large multi-stemmed shrub (probably about 10' high) directly behind the shed. It was covered in blooms. The flowers were about 4" across, a pure white, and fleshy with an extremely exotic stamen in the centre. The scent was fantastic. I assumed it was a magnolia, but one I had never seen before. It did look somewhat akin to a Camellia on steroids, except Camellia would never survive outside in Zone 6. It is also unusual to find a magnolia that blooms during the summer, most being Spring flowering even before their leaves emerge. Although Spring magnolias are a wonderful sight, they also are at great risk for bud kill due to late frosts. The rooting hormone experiment failed miserably. So as usual, I started to search and found it quite quickly. 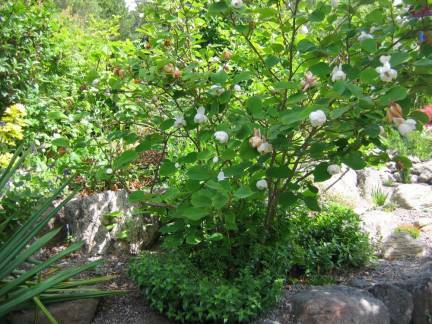 The plant in question was Magnolia Sieboldii, which up until recently was not that easy to get in Nova Scotia. Most gardeners want a stunning Spring display, so they opt for Magnolia Soulangeana (tulip magnolia) or Magnolia Stellata (star magnolia). I've never cared for Star Magnolias. Not enough oomph for the wait. 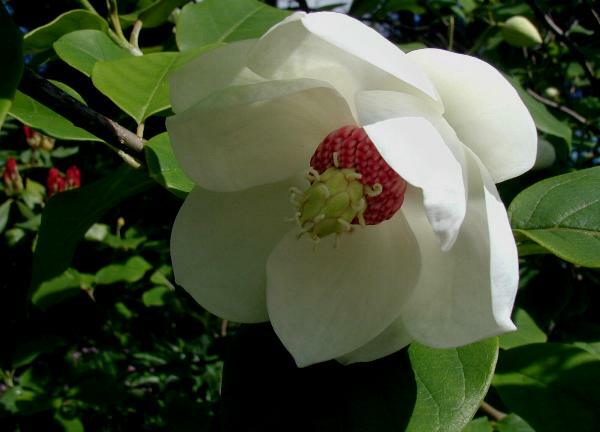 Magnolia sieboldii, also known as Oyama Magnolia, is a species of Magnolia native to eastern Asia in China, Japan, and Korea. It is named after Dr. Philipp Franz von Siebold (1796–1866), of Germany. He was the first European to teach medicine in Japan, and also gained fame for his study of Japanese flora and fauna. Magnolia sieboldii is a large shrub or small tree. The stalks, young leaves, young twigs and young buds are downy. 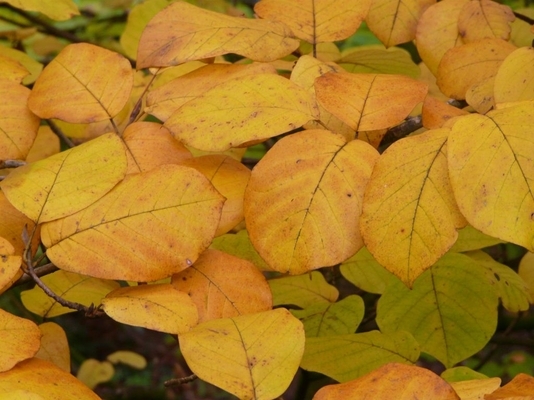 The leaves are elliptical to oblong, 5-6" long and 2-3" wide. 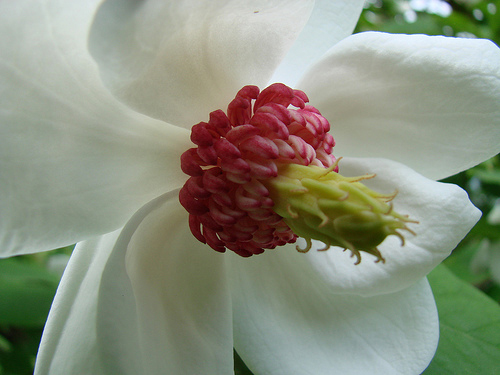 The flowers, unlike the better-known spring flowering Magnolias, open primarily in the early summer, but continue intermittently until late summer. They are pendulous, cup-shaped, 7-10 cm diameter, and have 6-12 tepals, the outer three smaller, the rest larger, and pure white; the carpels are greenish and the stamens reddish-purple or greenish-white. After the flowers fade, ornamental red seed pods add Autumn interest. 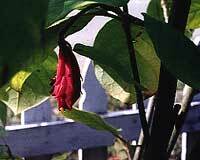 It is one of the hardiest magnolias, successful in cultivation as far north as Finland. Two years ago I had to do some searching to locate these to buy. Apparently people (or garden centers) have begun to discover the merits of this highly ornamental and hardy specimen tree. I can think of two places instantly where you can purchase them: Blomidon Nurseries just outside Wolfville in the Annapolis Valley, and Wile's Farm Market, just outside Bridgewater on the South Shore. There are probably many more throughout the province. Blomidon Nurseries is a massive garden centre with an equally massive selection of trees, shrubs, vegetables, annuals annuals, perennials, bulbs and garden items. It's well worth the hour plus drive from Halifax. Take the 101 out to the Valley, and then Exit 11. If you miss it, you're blind. It's huge. Make it a yearly pilgrimage. Wile's Farm Market in Wileville receives at least some of its plants from Blomidon, so if they have it, Wile's should be able to get it. I believe Wile's has at least three Sieboldii overwintering with them right now. I purchased two Sieboldii from Blomidon in 2009, each about 10' high and in a 24" wide pot. I jammed them into the back of the Jeep with Henry and we went on our merry way. I'm certain that he thought he was in the jungle! I was checking winter progress in the garden last weekend and the Sieboldii seem to be holding up well. I'm expecting great things this year. Or else in the trash they go! Not really. It's a drop dead gorgeous thing in bloom. Well worth the wait. Buy one, or two, or three! !